C in the atmosphere, which attained a maximum in about 1965 of almost twice what it had been before the testing began. C atoms in the sample and not just the few that happen to decay during the measurements; it can therefore be used with much smaller samples (as small as individual plant seeds), and gives results much more quickly. The development of radiocarbon dating has had a profound impact on archaeology. In addition to permitting more accurate dating within archaeological sites than previous methods, it allows comparison of dates of events across great distances. Histories of archaeology often refer to its impact as the "radiocarbon revolution". Radiocarbon dating has allowed key transitions in prehistory to be dated, such as the end of the last ice age, and the beginning of the Neolithic and Bronze Age in different regions. C. At some time during World War II, Willard Libby, who was then at Berkeley, learned of Korff's research and conceived the idea that it might be possible to use radiocarbon for dating. C. By contrast, methane created from petroleum showed no radiocarbon activity because of its age. The results were summarized in a paper in Science in 1947, in which the authors commented that their results implied it would be possible to date materials containing carbon of organic origin. Libby and James Arnold proceeded to test the radiocarbon dating theory by analyzing samples with known ages. For example, two samples taken from the tombs of two Egyptian kings, Zoser and Sneferu, independently dated to 2625 BC plus or minus 75 years, were dated by radiocarbon measurement to an average of 2800 BC plus or minus 250 years. These results were published in Science in 1949. [note 2] Within 11 years of their announcement, more than 20 radiocarbon dating laboratories had been set up worldwide. In 1960, Libby was awarded the Nobel Prize in Chemistry for this work. C atoms currently in the sample, allows the calculation of t, the age of the sample, using the equation above. C will remain; a quarter will remain after 11,460 years; an eighth after 17,190 years; and so on. C ratio has not changed over time. C in equilibrium with the atmosphere. C ratio lower than that of the biosphere. C for the northern and southern hemispheres, showing percentage excess above pre-bomb levels. The Partial Test Ban Treaty went into effect on 10 October 1963. C ratio. These curves are described in more detail below. C activity if the additional carbon from fossil fuels were distributed throughout the carbon exchange reservoir, but because of the long delay in mixing with the deep ocean, the actual effect is a 3% reduction. 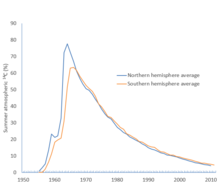 C in the atmosphere, with the peak level occurring in 1964 for the northern hemisphere, and in 1966 for the southern hemisphere. The level has since dropped, as this bomb pulse or "bomb carbon" (as it is sometimes called) percolates into the rest of the reservoir. C ratios in plants that differ from the ratios in the atmosphere. This effect is known as isotopic fractionation. C,[note 10] most measured δ13C values are negative. 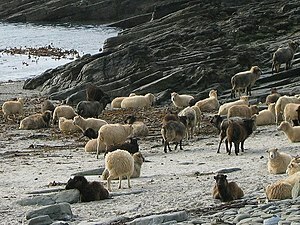 North Ronaldsay sheep on the beach in North Ronaldsay. In the winter, these sheep eat seaweed, which has a higher δ13C content than grass; samples from these sheep have a δ13C value of about −13‰, which is much higher than for sheep that feed on grasses. C relative to the diet. C ratio can be accurately measured by mass spectrometry. Typical values of δ13C have been found by experiment for many plants, as well as for different parts of animals such as bone collagen, but when dating a given sample it is better to determine the δ13C value for that sample directly than to rely on the published values. C radiation are similar to measurements for the rest of the biosphere. Correcting for isotopic fractionation, as is done for all radiocarbon dates to allow comparison between results from different parts of the biosphere, gives an apparent age of about 400 years for ocean surface water. C ratio in the exchange reservoir is constant all over the world, but it has since been discovered that there are several causes of variation in the ratio across the reservoir. 2 with the surface waters, and as a result water from some deep ocean areas has an apparent radiocarbon age of several thousand years. Upwelling mixes this "old" water with the surface water, giving the surface water an apparent age of about several hundred years (after correcting for fractionation). This effect is not uniform – the average effect is about 400 years, but there are local deviations of several hundred years for areas that are geographically close to each other. These deviations can be accounted for in calibration, and users of software such as CALIB can provide as an input the appropriate correction for the location of their samples. The effect also applies to marine organisms such as shells, and marine mammals such as whales and seals, which have radiocarbon ages that appear to be hundreds of years old. C is removed from the southern atmosphere more quickly than in the north. The effect is strengthened by strong upwelling around Antarctica. C ratio of the water it enters, which can lead to apparent ages of thousands of years for both the affected water and the plants and freshwater organisms that live in it. This is known as the hard water effect because it is often associated with calcium ions, which are characteristic of hard water; other sources of carbon such as humus can produce similar results, and can also reduce the apparent age if they are of more recent origin than the sample. The effect varies greatly and there is no general offset that can be applied; additional research is usually needed to determine the size of the offset, for example by comparing the radiocarbon age of deposited freshwater shells with associated organic material. C ratios: for example, plants in the neighbourhood of the Furnas caldera in the Azores were found to have apparent ages that ranged from 250 years to 3320 years. C, causes an error in the other direction independent of age – a sample contaminated with 1% old carbon will appear to be about 80 years older than it really is, regardless of the date of the sample. C content; this can mean conversion to gaseous, liquid, or solid form, depending on the measurement technique to be used. Before this can be done, the sample must be treated to remove any contamination and any unwanted constituents. This includes removing visible contaminants, such as rootlets that may have penetrated the sample since its burial. Alkali and acid washes can be used to remove humic acid and carbonate contamination, but care has to be taken to avoid removing the part of the sample that contains the carbon to be tested. It is common to reduce a wood sample to just the cellulose component before testing, but since this can reduce the volume of the sample to 20% of its original size, testing of the whole wood is often performed as well. Charcoal is often tested but is likely to need treatment to remove contaminants. Unburnt bone can be tested; it is usual to date it using collagen, the protein fraction that remains after washing away the bone's structural material. Hydroxyproline, one of the constituent amino acids in bone, was once thought to be a reliable indicator as it was not known to occur except in bone, but it has since been detected in groundwater. For burnt bone, testability depends on the conditions under which the bone was burnt. If the bone was heated under reducing conditions, it (and associated organic matter) may have been carbonized. In this case the sample is often usable. Shells from both marine and land organisms consist almost entirely of calcium carbonate, either as aragonite or as calcite, or some mixture of the two. Calcium carbonate is very susceptible to dissolving and recrystallizing; the recrystallized material will contain carbon from the sample's environment, which may be of geological origin. If testing recrystallized shell is unavoidable, it is sometimes possible to identify the original shell material from a sequence of tests. It is also possible to test conchiolin, an organic protein found in shell, but it constitutes only 1–2% of shell material. The three major components of peat are humic acid, humins, and fulvic acid. Of these, humins give the most reliable date as they are insoluble in alkali and less likely to contain contaminants from the sample's environment. A particular difficulty with dried peat is the removal of rootlets, which are likely to be hard to distinguish from the sample material. Soil contains organic material, but because of the likelihood of contamination by humic acid of more recent origin, it is very difficult to get satisfactory radiocarbon dates. It is preferable to sieve the soil for fragments of organic origin, and date the fragments with methods that are tolerant of small sample sizes. Other materials that have been successfully dated include ivory, paper, textiles, individual seeds and grains, straw from within mud bricks, and charred food remains found in pottery. C ratio in old material and extends the maximum age that can be reliably reported. 2 can also be used. The quantity of material needed for testing depends on the sample type and the technology being used. There are two types of testing technology: detectors that record radioactivity, known as beta counters, and accelerator mass spectrometers. For beta counters, a sample weighing at least 10 grams (0.35 ounces) is typically required. Accelerator mass spectrometry is much more sensitive, and samples containing as little as 0.5 milligrams of carbon can be used. C ratio can be converted into each other exactly. For some time, beta counting methods were more accurate than AMS, but AMS is now more accurate and has become the method of choice for radiocarbon measurements. In addition to improved accuracy, AMS has two further significant advantages over beta counting: it can perform accurate testing on samples much too small for beta counting; and it is much faster – an accuracy of 1% can be achieved in minutes with AMS, which is far quicker than would be achievable with the older technology. C are so weak that half are stopped by a 0.01 mm thickness of aluminium. C atoms; the bursts are proportional to the energy of the particle, so other sources of ionization, such as background radiation, can be identified and ignored. The counters are surrounded by lead or steel shielding, to eliminate background radiation and to reduce the incidence of cosmic rays. In addition, anticoincidence detectors are used; these record events outside the counter, and any event recorded simultaneously both inside and outside the counter is regarded as an extraneous event and ignored. C as they interact with a fluorescing agent added to the benzene. Like gas counters, liquid scintillation counters require shielding and anticoincidence counters. C. In addition, a sample with a standard activity is measured, to provide a baseline for comparison. C signal from the process blank measures the amount of contamination introduced during the preparation of the sample. These measurements are used in the subsequent calculation of the age of the sample. The calculations to be performed on the measurements taken depend on the technology used, since beta counters measure the sample's radioactivity whereas AMS determines the ratio of the three different carbon isotopes in the sample. To determine the age of a sample whose activity has been measured by beta counting, the ratio of its activity to the activity of the standard must be found. To determine this, a blank sample (of old, or dead, carbon) is measured, and a sample of known activity is measured. The additional samples allow errors such as background radiation and systematic errors in the laboratory setup to be detected and corrected for. The most common standard sample material is oxalic acid, such as the HOxII standard, 1,000 lb of which was prepared by the National Institute of Standards and Technology (NIST) in 1977 from French beet harvests. C ratio that would have been measured in 1950 had there been no fossil fuel effect. The calculation uses 8,033, the mean-life derived from Libby's half-life of 5,568 years, not 8,267, the mean-life derived from the more accurate modern value of 5,730 years. Libby’s value for the half-life is used to maintain consistency with early radiocarbon testing results; calibration curves include a correction for this, so the accuracy of final reported calendar ages is assured. C to be measured with the same error term of 80 years. C to be measurable. Older dates have been obtained by using special sample preparation techniques, large samples, and very long measurement times. These techniques can allow measurement of dates up to 60,000 and in some cases up to 75,000 years before the present. Radiocarbon dates are generally presented with a range of one standard deviation (usually represented by the Greek letter sigma as 1σ) on either side of the mean. However, a date range of 1σ represents only 68% confidence level, so the true age of the object being measured may lie outside the range of dates quoted. This was demonstrated in 1970 by an experiment run by the British Museum radiocarbon laboratory, in which weekly measurements were taken on the same sample for six months. The results varied widely (though consistently with a normal distribution of errors in the measurements), and included multiple date ranges (of 1σ confidence) that did not overlap with each other. The measurements included one with a range from about 4250 to about 4390 years ago, and another with a range from about 4520 to about 4690. C ratio had been constant historically. Although Libby had pointed out as early as 1955 the possibility that this assumption was incorrect, it was not until discrepancies began to accumulate between measured ages and known historical dates for artefacts that it became clear that a correction would need to be applied to radiocarbon ages to obtain calendar dates. To produce a curve that can be used to relate calendar years to radiocarbon years, a sequence of securely dated samples is needed which can be tested to determine their radiocarbon age. The study of tree rings led to the first such sequence: individual pieces of wood show characteristic sequences of rings that vary in thickness because of environmental factors such as the amount of rainfall in a given year. These factors affect all trees in an area, so examining tree-ring sequences from old wood allows the identification of overlapping sequences. In this way, an uninterrupted sequence of tree rings can be extended far into the past. The first such published sequence, based on bristlecone pine tree rings, was created by Wesley Ferguson. Hans Suess used this data to publish the first calibration curve for radiocarbon dating in 1967. The curve showed two types of variation from the straight line: a long term fluctuation with a period of about 9,000 years, and a shorter term variation, often referred to as "wiggles", with a period of decades. Suess said he drew the line showing the wiggles by "cosmic schwung", by which he meant that the variations were caused by extraterrestrial forces. It was unclear for some time whether the wiggles were real or not, but they are now well-established. These short term fluctuations in the calibration curve are now known as de Vries effects, after Hessel de Vries. A calibration curve is used by taking the radiocarbon date reported by a laboratory, and reading across from that date on the vertical axis of the graph. The point where this horizontal line intersects the curve will give the calendar age of the sample on the horizontal axis. This is the reverse of the way the curve is constructed: a point on the graph is derived from a sample of known age, such as a tree ring; when it is tested, the resulting radiocarbon age gives a data point for the graph. The Northern hemisphere curve from INTCAL13. As of 2014 this is the most recent version of the standard calibration curve. The diagonal line shows where the curve would lie if radiocarbon ages and calendar ages were the same. Over the next thirty years many calibration curves were published using a variety of methods and statistical approaches. These were superseded by the INTCAL series of curves, beginning with INTCAL98, published in 1998, and updated in 2004, 2009, and 2013. The improvements to these curves are based on new data gathered from tree rings, varves, coral, plant macrofossils, speleothems, and foraminifera. The INTCAL13 data includes separate curves for the northern and southern hemispheres, as they differ systematically because of the hemisphere effect. The southern curve (SHCAL13) is based on independent data where possible, and derived from the northern curve by adding the average offset for the southern hemisphere where no direct data was available. There is also a separate marine calibration curve, MARINE13. For a set of samples forming a sequence with a known separation in time, these samples form a subset of the calibration curve. The sequence can be compared to the calibration curve and the best match to the sequence established. This “wiggle-matching” technique can lead to more precise dating than is possible with individual radiocarbon dates. Wiggle-matching can be used in places where there is a plateau on the calibration curve, and hence can provide a much more accurate date than the intercept or probability methods are able to produce. The technique is not restricted to tree rings; for example, a stratified tephra sequence in New Zealand, believed to predate human colonization of the islands, has been dated to 1314 AD ± 12 years by wiggle-matching. The wiggles also mean that reading a date from a calibration curve can give more than one answer: this occurs when the curve wiggles up and down enough that the radiocarbon age intercepts the curve in more than one place, which may lead to a radiocarbon result being reported as two separate age ranges, corresponding to the two parts of the curve that the radiocarbon age intercepted. Bayesian statistical techniques can be applied when there are several radiocarbon dates to be calibrated. For example, if a series of radiocarbon dates is taken from different levels in a stratigraphic sequence, Bayesian analysis can be used to evaluate dates which are outliers, and can calculate improved probability distributions, based on the prior information that the sequence should be ordered in time. When Bayesian analysis was introduced, its use was limited by the need to use mainframe computers to perform the calculations, but the technique has since been implemented on programs available for personal computers, such as OxCal. Several formats for citing radiocarbon results have been used since the first samples were dated. As of 2019, the standard format required by the journal Radiocarbon is as follows. <range> is the laboratory's estimate of the error in the age, at 1σ confidence. BP stands for "before present", referring to a reference date of 1950, so that 500 BP means the year 1450 AD. C yr BP might be used to distinguish the uncalibrated date from a date derived from another dating method such as thermoluminescence. <confidence> indicates the confidence level for the given date range. For example, "cal 1220–1281 AD (1σ)" means a calibrated date for which the true date lies between 1220 AD and 1281 AD, with the confidence level given as 1σ, or one standard deviation. Calibrated dates can also be expressed as BP instead of using BC and AD. The curve used to calibrate the results should be the latest available INTCAL curve. Calibrated dates should also identify any programs, such as OxCal, used to perform the calibration. In addition, an article in Radiocarbon in 2014 about radiocarbon date reporting conventions recommends that information should be provided about sample treatment, including the sample material, pretreatment methods, and quality control measurements; that the citation to the software used for calibration should specify the version number and any options or models used; and that the calibrated date should be given with the associated probabilities for each range. A key concept in interpreting radiocarbon dates is archaeological association: what is the true relationship between two or more objects at an archaeological site? It frequently happens that a sample for radiocarbon dating can be taken directly from the object of interest, but there are also many cases where this is not possible. Metal grave goods, for example, cannot be radiocarbon dated, but they may be found in a grave with a coffin, charcoal, or other material which can be assumed to have been deposited at the same time. In these cases a date for the coffin or charcoal is indicative of the date of deposition of the grave goods, because of the direct functional relationship between the two. There are also cases where there is no functional relationship, but the association is reasonably strong: for example, a layer of charcoal in a rubbish pit provides a date which has a relationship to the rubbish pit. Contamination is of particular concern when dating very old material obtained from archaeological excavations and great care is needed in the specimen selection and preparation. In 2014, Thomas Higham and co-workers suggested that many of the dates published for Neanderthal artefacts are too recent because of contamination by "young carbon". As a tree grows, only the outermost tree ring exchanges carbon with its environment, so the age measured for a wood sample depends on where the sample is taken from. This means that radiocarbon dates on wood samples can be older than the date at which the tree was felled. In addition, if a piece of wood is used for multiple purposes, there may be a significant delay between the felling of the tree and the final use in the context in which it is found. This is often referred to as the "old wood" problem. One example is the Bronze Age trackway at Withy Bed Copse, in England; the trackway was built from wood that had clearly been worked for other purposes before being re-used in the trackway. Another example is driftwood, which may be used as construction material. It is not always possible to recognize re-use. Other materials can present the same problem: for example, bitumen is known to have been used by some Neolithic communities to waterproof baskets; the bitumen's radiocarbon age will be greater than is measurable by the laboratory, regardless of the actual age of the context, so testing the basket material will give a misleading age if care is not taken. A separate issue, related to re-use, is that of lengthy use, or delayed deposition. For example, a wooden object that remains in use for a lengthy period will have an apparent age greater than the actual age of the context in which it is deposited. Archaeology is not the only field to make use of radiocarbon dating. The ability to date minute samples using AMS has meant that palaeobotanists and palaeoclimatologists can use radiocarbon dating on pollen samples. Radiocarbon dates can also be used in geology, sedimentology, and lake studies, for example. Dates on organic material recovered from strata of interest can be used to correlate strata in different locations that appear to be similar on geological grounds. Dating material from one location gives date information about the other location, and the dates are also used to place strata in the overall geological timeline. The Pleistocene is a geological epoch that began about 2.6 million years ago. The Holocene, the current geological epoch, begins about 11,700 years ago, when the Pleistocene ends. Establishing the date of this boundary − which is defined by sharp climatic warming − as accurately as possible has been a goal of geologists for much of the 20th century. At Two Creeks, in Wisconsin, a fossil forest was discovered (Two Creeks Buried Forest State Natural Area), and subsequent research determined that the destruction of the forest was caused by the Valders ice readvance, the last southward movement of ice before the end of the Pleistocene in that area. Before the advent of radiocarbon dating, the fossilized trees had been dated by correlating sequences of annually deposited layers of sediment at Two Creeks with sequences in Scandinavia. This led to estimates that the trees were between 24,000 and 19,000 years old, and hence this was taken to be the date of the last advance of the Wisconsin glaciation before its final retreat marked the end of the Pleistocene in North America. In 1952 Libby published radiocarbon dates for several samples from the Two Creeks site and two similar sites nearby; the dates were averaged to 11,404 BP with a standard error of 350 years. This result was uncalibrated, as the need for calibration of radiocarbon ages was not yet understood. Further results over the next decade supported an average date of 11,350 BP, with the results thought to be most accurate averaging 11,600 BP. There was initial resistance to these results on the part of Ernst Antevs, the palaeobotanist who had worked on the Scandinavian varve series, but his objections were eventually discounted by other geologists. In the 1990s samples were tested with AMS, yielding (uncalibrated) dates ranging from 11,640 BP to 11,800 BP, both with a standard error of 160 years. Subsequently, a sample from the fossil forest was used in an interlaboratory test, with results provided by over 70 laboratories. These tests produced a median age of 11,788 ± 8 BP (2σ confidence) which when calibrated gives a date range of 13,730 to 13,550 cal BP. The Two Creeks radiocarbon dates are now regarded as a key result in developing the modern understanding of North American glaciation at the end of the Pleistocene. 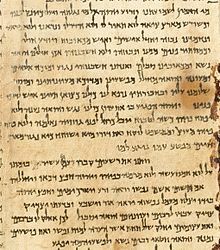 In 1947, scrolls were discovered in caves near the Dead Sea that proved to contain writing in Hebrew and Aramaic, most of which are thought to have been produced by the Essenes, a small Jewish sect. These scrolls are of great significance in the study of Biblical texts because many of them contain the earliest known version of books of the Hebrew bible. A sample of the linen wrapping from one of these scrolls, the Great Isaiah Scroll, was included in a 1955 analysis by Libby, with an estimated age of 1,917 ± 200 years. Based on an analysis of the writing style, palaeographic estimates were made of the age of 21 of the scrolls, and samples from most of these, along with other scrolls which had not been palaeographically dated, were tested by two AMS laboratories in the 1990s. The results ranged in age from the early 4th century BC to the mid 4th century AD. In all but two cases the scrolls were determined to be within 100 years of the palaeographically determined age. The Isaiah scroll was included in the testing and was found to have two possible date ranges at a 2σ confidence level, because of the shape of the calibration curve at that point: there is a 15% chance that it dates from 355–295 BC, and an 84% chance that it dates from 210–45 BC. Subsequently, these dates were criticized on the grounds that before the scrolls were tested, they had been treated with modern castor oil in order to make the writing easier to read; it was argued that failure to remove the castor oil sufficiently would have caused the dates to be too young. Multiple papers have been published both supporting and opposing the criticism. C research laboratories. It quickly became apparent that the principles of radiocarbon dating were valid, despite certain discrepancies, the causes of which then remained unknown. C date was incorrect. Taylor also suggests that the availability of definite date information freed archaeologists from the need to focus so much of their energy on determining the dates of their finds, and led to an expansion of the questions archaeologists were willing to research. For example, from the 1970s questions about the evolution of human behaviour were much more frequently seen in archaeology. The dating framework provided by radiocarbon led to a change in the prevailing view of how innovations spread through prehistoric Europe. Researchers had previously thought that many ideas spread by diffusion through the continent, or by invasions of peoples bringing new cultural ideas with them. As radiocarbon dates began to prove these ideas wrong in many instances, it became apparent that these innovations must sometimes have arisen locally. This has been described as a "second radiocarbon revolution", and with regard to British prehistory, archaeologist Richard Atkinson has characterized the impact of radiocarbon dating as "radical ... therapy" for the "progressive disease of invasionism". More broadly, the success of radiocarbon dating stimulated interest in analytical and statistical approaches to archaeological data. Taylor has also described the impact of AMS, and the ability to obtain accurate measurements from very small samples, as ushering in a third radiocarbon revolution. Occasionally, radiocarbon dating techniques date an object of popular interest, for example the Shroud of Turin, a piece of linen cloth thought by some to bear an image of Jesus Christ after his crucifixion. Three separate laboratories dated samples of linen from the Shroud in 1988; the results pointed to 14th-century origins, raising doubts about the shroud's authenticity as an alleged 1st-century relic. Cl. With the development of AMS in the 1980s it became possible to measure these isotopes precisely enough for them to be the basis of useful dating techniques, which have been primarily applied to dating rocks. Naturally occurring radioactive isotopes can also form the basis of dating methods, as with potassium–argon dating, argon–argon dating, and uranium series dating. Other dating techniques of interest to archaeologists include thermoluminescence, optically stimulated luminescence, electron spin resonance, and fission track dating, as well as techniques that depend on annual bands or layers, such as dendrochronology, tephrochronology, and varve chronology. ^ Korff's paper actually referred to slow neutrons, a term that since Korff's time has acquired a more specific meaning, referring to a range of neutron energies that does not overlap with thermal neutrons. ^ Some of Libby's original samples have since been retested, and the results, published in 2018, were generally in good agreement with Libby's original results. ^ Two experimentally determined values from the early 1950s were not included in the value Libby used: ~6,090 years, and 5900 ± 250 years. ^ The data on carbon percentages in each part of the reservoir is drawn from an estimate of reservoir carbon for the mid-1990s; estimates of carbon distribution during pre-industrial times are significantly different. ^ For marine life, the age only appears to be 400 years once a correction for fractionation is made. This effect is accounted for during calibration by using a different marine calibration curve; without this curve, modern marine life would appear to be 400 years old when radiocarbon dated. Similarly, the statement about land organisms is only true once fractionation is taken into account. ^ "PDB" stands for "Pee Dee Belemnite", a fossil from the Pee Dee formation in South Carolina. ^ The PDB value is 11.2372‰. ^ Two recent estimates included 8-80 radiocarbon years over the last 1000 years, with an average of 41 ± 14 years; and -2 to 83 radiocarbon years over the last 2000 years, with an average of 44 ± 17 years. For older datasets an offset of about 50 years has been estimated. It can be cited as: Christie M, et al. (2018). "Radiocarbon dating". WikiJournal of Science. 1 (1): 6. doi:10.15347/wjs/2018.006. ^ a b Taylor & Bar-Yosef (2014), p. 268. ^ a b Taylor & Bar-Yosef (2014), p. 269. ^ a b "Radiocarbon Dating – American Chemical Society". American Chemical Society. Retrieved 2016-10-09. ^ a b c d e f g h i j k l m n o p q r Bowman (1995), pp. 9–15. ^ Arnold, J.R.; Libby, W.F. (1949). "Age determinations by radiocarbon content: checks with samples of known age". Science. 110 (2869): 678–680. Bibcode:1949Sci...110..678A. doi:10.1126/science.110.2869.678. JSTOR 1677049. PMID 15407879. ^ Aitken (1990), pp. 60–61. ^ Jull, A.J.T. ; Pearson, C.L. ; Taylor, R.E. ; Southon, J.R.; Santos, G.M. ; Kohl, C.P. ; Hajdas, I.; Molnar, M.; Baisan, C.; Lange, T.E. ; Cruz, R.; Janovics, R.; Major, I. (2018). "Radiocarbon dating and intercomparison of some early historical radiocarbon samples". Radiocarbon. 60 (2): 535–548. doi:10.1017/RDC.2018.18. ^ "The method". www.c14dating.com. Retrieved 2016-10-09. ^ a b Russell, Nicola (2011). Marine radiocarbon reservoir effects (MRE) in archaeology: temporal and spatial changes through the Holocene within the UK coastal environment (PhD thesis) (PDF). Glasgow, Scotland UK: University of Glasgow. p. 16. Retrieved 11 December 2017. ^ Bianchi & Canuel (2011), p. 35. C: production and examples of its unique applications in studies of terrestrial and extraterrestrial processes". Radiocarbon. 43 (2): 731–742. doi:10.6028/jres.109.013. PMC 4853109. PMID 27366605. ^ a b Queiroz-Alves, Eduardo; Macario, Kita; Ascough, Philippa; Bronk Ramsey, Christopher (2018). "The worldwide marine radiocarbon reservoir effect: Definitions, mechanisms and prospects" (PDF). Reviews of Geophysics. 56 (1): 278–305. Bibcode:2018RvGeo..56..278A. doi:10.1002/2017RG000588. ^ a b c Tsipenyuk (1997), p. 343. ^ a b Currie, Lloyd A. (2004). "The remarkable metrological history of radiocarbon dating II". Journal of Research of the National Institute of Standards and Technology. 109 (2): 185–217. doi:10.6028/jres.109.013. PMC 4853109. PMID 27366605. ^ Taylor & Bar-Yosef (2014), p. 33. ^ Libby (1965), p. 42. ^ Aitken (1990), p. 59. ^ a b c d e f g h Aitken (1990), pp. 61–66. ^ a b c Aitken (1990), pp. 92–95. ^ a b Bowman (1995), p. 42. ^ Engelkemeir, Antoinette G.; Hamill, W.H. ; Inghram, Mark G.; Libby, W.F. (1949). "The Half-Life of Radiocarbon (C14)". Physical Review. 75 (12): 1825. Bibcode:1949PhRv...75.1825E. doi:10.1103/PhysRev.75.1825. ^ Frederick Johnson (1951). "Introduction". Memoirs of the Society for American Archaeology (8): 1–19. JSTOR 25146610. ^ H. Godwin (1962). "Half-life of Radiocarbon". Nature. 195 (4845): 984. doi:10.1038/195984a0. ^ J.van der Plicht and A.Hogg (2006). "A note on reporting radiocarbon" (PDF). Quaternary Geochronology. 1 (4): 237–240. doi:10.1016/j.quageo.2006.07.001. Retrieved 9 December 2017. ^ Taylor & Bar-Yosef (2014), p. 287. ^ a b c d Reimer, Paula J.; Bard, Edouard; Bayliss, Alex; Beck, J. Warren; Blackwell, Paul G.; Ramsey, Christopher Bronk; Buck, Caitlin E.; Cheng, Hai; Edwards, R. Lawrence (2013). "IntCal13 and Marine13 Radiocarbon Age Calibration Curves 0–50,000 Years cal BP". Radiocarbon. 55 (4): 1869–1887. doi:10.2458/azu_js_rc.55.16947. ISSN 0033-8222. ^ Taylor & Bar-Yosef (2014), pp. 26–27. ^ Post (2001) pp. 128–129. ^ Aitken (2003), p. 506. ^ Warneck (2000), p. 690. ^ Ferronsky & Polyakov (2012), p. 372. ^ a b c d e f g Bowman (1995), pp. 24–27. ^ a b c Cronin (2010), p. 35. ^ a b Hua, Quan; Barbetti, Mike; Rakowski, Andrzej Z. (2013). "Atmospheric Radiocarbon for the Period 1950–2010". Radiocarbon. 55 (4): 2059–2072. doi:10.2458/azu_js_rc.v55i2.16177. ISSN 0033-8222. ^ a b c d e f g Bowman (1995), pp. 16–20. ^ a b c Suess (1970), p. 303. ^ a b c Taylor & Bar-Yosef (2014), pp. 50–52. ^ a b c d Bowman (1995), pp. 43–49. ^ a b Aitken (1990), pp. 71–72. ^ "Treaty Banning Nuclear Weapon Tests in the Atmosphere, in Outer Space and Under Water". US Department of State. Retrieved 2 February 2015. ^ a b c d e f g Bowman (1995), pp. 20–23. ^ a b c d e f Maslin & Swann (2006), p. 246. ^ Taylor & Bar-Yosef (2014), p. 125. ^ Dass (2007), p. 276. ^ a b Libby (1965), p. 6. ^ a b Hogg et al. (2013), p. 1898. ^ Taylor & Bar-Yosef (2014), pp. 74–75. ^ Pasquier-Cardina et al. (1999), pp. 200–201. ^ Aitken (1990), pp. 85–86. ^ a b c d e f Bowman (1995), pp. 27–30. ^ a b c d e f Aitken (1990), pp. 86–89. ^ Šilar (2004), p. 166. ^ Bowman (1995), pp. 37–42. ^ a b c d e f g h Bowman (1995), pp. 31–37. ^ a b c d e Aitken (1990), pp. 76–78. ^ Trumbore (1996), p. 318. ^ Taylor & Bar-Yosef (2014), pp. 103–104. ^ Walker (2005), p. 20. ^ a b Walker (2005), p. 23. ^ Killick (2014), p. 166. ^ Malainey (2010), p. 96. ^ Theodórsson (1996), p. 24. ^ L'Annunziata & Kessler (2012), p. 424. ^ a b Eriksson Stenström et al. (2011), p. 3. ^ a b Aitken (1990), pp. 82–85. ^ Wiebert (1995), p. 16. ^ Tuniz, Zoppi & Barbetti (2004), p. 395. ^ a b c McNichol, A.P. ; Jull, A.T.S. ; Burr, G.S. (2001). "Converting AMS data to radiocarbon values: considerations and conventions". Radiocarbon. 43 (2A): 313–320. doi:10.1017/S0033822200038169. ^ Terasmae (1984), p. 5. ^ L'Annunziata (2007), p. 528. ^ a b "Radiocarbon Data Calculations: NOSAMS". Woods Hole Oceanographic Institution. 2007. Retrieved 27 August 2013. ^ Bowman (1995), pp. 38–39. ^ Taylor (1987), pp. 125–126. ^ Bowman (1995), pp. 40–41. ^ Taylor & Bar-Yosef (2014), p. 155. ^ a b Aitken (1990), p. 66–67. ^ Taylor & Bar-Yosef (2014), p. 59. ^ Taylor & Bar-Yosef (2014), pp. 53–54. C ages of marine samples to 10,000 BC". Radiocarbon. 35 (1): 137–189. doi:10.1017/s0033822200013874. ^ a b Walker (2005), pp. 35–37. ^ Aitken (1990), pp. 103–105. ^ Walker (2005), pp. 207–209. ^ Taylor & Bar-Yosef (2014), pp. 148–149. ^ a b c "Radiocarbon: Information for Authors" (PDF). Radiocarbon. University of Arizona. May 25, 2011. pp. 5–7. Archived from the original (PDF) on 10 August 2013. Retrieved 1 January 2014. ^ Taylor & Bar-Yosef (2014), p. 29. ^ Millard, Andrew R. (2014). "Conventions for Reporting Radiocarbon Determinations" (PDF). Radiocarbon. 56 (2): 555–559. doi:10.2458/56.17455. ^ Mook & Waterbolk (1985), pp. 48–49. ^ Higham, T.; et al. (2014). "The timing and spatiotemporal patterning of Neanderthal disappearance". Nature. 512 (7514): 306–309. Bibcode:2014Natur.512..306H. doi:10.1038/nature13621. PMID 25143113. ^ a b Bowman (1995), pp. 53–54. ^ Godwin, Harry (1961). "The Croonian Lecture: Radiocarbon Dating and Quaternary History in Britain". Proceedings of the Royal Society of London B: Biological Sciences. 153 (952): 287–320. Bibcode:1961RSPSB.153..287G. doi:10.1098/rspb.1961.0001. ^ a b c d Taylor & Bar-Yosef (2014), pp. 34–37. ^ Bousman & Vierra (2012), p. 4. ^ a b Macdougall (2008), pp. 94–95. ^ a b c Taylor & Bar-Yosef (2014), pp. 38–42. ^ Libby (1965), p. 84. ^ Taylor & Bar-Yosef (2014), p. 288. ^ Taylor (1997), p. 70. ^ a b Taylor (1987), pp. 143–146. ^ Renfrew (2014), p. 13. ^ Walker (2005), pp. 77–79. ^ Walker (2005), pp. 57–77. ^ Walker (2005), pp. 93–162. Aitken, Martin J. (2003). "Radiocarbon Dating". In Ellis, Linda. Archaeological Method and Theory. New York: Garland Publishing. pp. 505–508. Bousman, C. Britt; Vierra, Bradley J. (2012). "Chronology, Environmental Setting, and Views of the Terminal Pleistocene and Early Holocene Cultural Transitions in North America". In Bousman, C. Britt; Vierra, Bradley J. From the Pleistocene to the Holocene: Human Organization and Cultural Transformations in Prehistoric North America. College Station, Texas: Texas A&M University Press. pp. 1–15. ISBN 978-1-60344-760-7. Killick, David (2014). "Using evidence from natural sciences in archaeology". In Chapman, Robert; Alison, Wylie. Material Evidence: Learning From Archaeological Practice. Abingdon, UK: Routledge. pp. 159–172. ISBN 978-0-415-83745-3. L'Annunziata, Michael F.; Kessler, Michael J. (2012). "Liquid scintillation analysis: principles and practice". In L'Annunziata, Michael F. Handbook of Radioactivity Analysis (3rd ed.). Oxford: Academic Press. pp. 423–573. doi:10.1016/b978-012436603-9/50010-7. ISBN 978-0-12-384873-4. Libby, Willard F. (1965) . Radiocarbon Dating (2nd (1955) ed.). Chicago: Phoenix. Maslin, Mark A.; Swann, George E.A. (2006). "Isotopes in marine sediments". In Leng, Melanie J. Isotopes in Palaeoenvironmental Research. Dordrecht: Springer. pp. 227–290. doi:10.1007/1-4020-2504-1_06. ISBN 978-1-4020-2503-7. Post, Wilfred M. (2001). "Carbon cycle". In Goudie, Andrew; Cuff, David J. Encyclopedia of Global Change: Environmental Change and Human Society, Volume 1. Oxford: Oxford University Press. pp. 127–130. ISBN 978-0-19-514518-2. Renfrew, Colin (2014). "Foreword". In Taylor, R.E. ; Bar-Yosef, Ofer. Radiocarbon Dating. Walnut Creek, California: Left Coast Press. pp. 12–14. ISBN 978-1-59874-590-0. Schoeninger, Margaret J. (2010). "Diet reconstruction and ecology using stable isotope ratios". In Larsen, Clark Spencer. A Companion to Biological Anthropology. Oxford: Blackwell. pp. 445–464. doi:10.1002/9781444320039.ch25. ISBN 978-1-4051-8900-2. Šilar, Jan (2004). "Application of environmental radionuclides in radiochronology: Radiocarbon". In Tykva, Richard; Berg, Dieter. Man-made and Natural Radioactivity in Environmental Pollution and Radiochronology. Dordrecht: Kluwer Academic Publishers. pp. 150–179. ISBN 978-1-4020-1860-2. Suess, H.E. (1970). "Bristlecone-pine calibration of the radiocarbon time-scale 5200 B.C. to the present". In Olsson, Ingrid U. Radiocarbon Variations and Absolute Chronology. New York: John Wiley & Sons. pp. 303–311. Taylor, R.E. (1997). "Radiocarbon dating". In Taylor, R.E. ; Aitken, Martin J. Chronometric Dating in Archaeology. New York: Plenum Press. pp. 65–97. ISBN 978-0-306-45715-9. Taylor, R.E. ; Bar-Yosef, Ofer (2014). Radiocarbon Dating (2nd ed.). Walnut Creek, California: Left Coast Press. ISBN 978-1-59874-590-0. Terasmae, J. (1984). "Radiocarbon dating: some problems and potential developments". In Mahaney, W.C. Quaternary Dating Methods. Amsterdam: Elsevier. pp. 1–15. ISBN 978-0-444-42392-4. Trumbore, Susan E. (1996). "Applications of accelerator mass spectrometry to soil science". In Boutton, Thomas W.; Yamasaki, Shin-ichi. Mass Spectrometry of Soils. New York: Marcel Dekker. pp. 311–340. ISBN 978-0-8247-9699-0. Tuniz, C.; Zoppi, U.; Barbetti, M. (2004). "Radionuclide dating in archaeology by accelerator mass spectrometry". In Martini, M.; Milazzo, M.; Piacentini, M. Physics Methods in Archaeometry. Amsterdam: IOS Press. pp. 385–405. ISBN 978-1-58603-424-5. This page was last edited on 23 March 2019, at 21:33 (UTC).